Check out the 2017 Islands Centres Programme and book a week on Iona or at Camas in 2017.
but we could make a difference. and we shall start now by sharing the food we have with each other. and we shall start now by opening our homes to strangers and friends. and we shall start now here: through accepting ourselves, our neighbours and spreading as much kindness as we can. and we shall start here and now through serving those we meet in our daily lives. Catch up on what’s been happening at Camas by reading the Camas blog. In November Hind Khoury of Kairos Palestine came to speak at the Iona Community’s new Glasgow base, and at other venues in Glasgow and Edinburgh, including the Hadeel Fair Trade shop. Hind’s address to the Community will be printed in an upcoming Coracle. The Kairos week in the Abbey and MacLeod Centre, 27 May-2 June, will look at all that has happened since the Kairos Palestine document (2009) inspired the Iona Call at Pentecost 2012 – to which many in the Iona Community have become signatories. It will find time to face tough questions about the inheritance of the Balfour Declaration, the implications of Boycott, Divestment and Sanctions and the threat of Christian Zionism. We will listen to stories from the region by recent visitors and those who have creative ways of engagement, such as academic links and exchanges, marketing crafts, making music, prayer and politics. It will be a chance to exchange ideas and information, be challenged and equipped for action. With leaders of the Kairos movements in Palestine (including, we hope, Hind Khoury) the US and the UK. The Iona Community’s new Glasgow base is humming with activity – including now being the venue for the newly formed Glasgow youth group IGLOW. Hannah Blyth, Camas Activity Worker, has temporarily joined the team to work alongside Iona Community Youth Resource Worker, Chris Long, for the winter. Welcome, Hannah! Between 11th and 14th July 2016, I went to the ‘Jungle’ in Calais as part of a group of five people from Durham for Refugees, a new university society officially formed in October. In Calais we volunteered with the Care4Calais charity, reporting to their warehouse each day. In the mornings we organised and sorted through aid and donations and prepared supplies for that day’s distribution. In the afternoons we went into the camp, either doing Container (distributing aid from a container based in the camp), or casual art and English classes. Something that really struck me was how kindhearted these people were – they were willing to let children and injured people skip the queue; if we were offering something they didn’t need they would refuse to take it, as they knew that, even though a second jumper or an extra toilet roll would be useful to them, there would be someone behind them who would need it more. One night the volunteers stayed in the camp to eat at one of the restaurants run by the refugees. The food was amazing and it was wonderful to see how people living in cramped and dirty tents could make a space so welcoming and hospitable. Although I was only in Calais for a few days, I met some amazing people and learned so much that I otherwise wouldn’t have known through the media. I have certainly learnt to be more appreciative of what I have and where I live – everyone I met spoke of England and London with longing as if it is a Utopia, yet we complain all the time. Now that the camp has been disbanded I hope that the refugees can set up a new ‘home’ and that more help can be given to them to allow them to move into more permanent residences. The cover of Joy Mead’s book Glimpsed in Passing, with artwork by Stephen Raw, has been chosen for an exhibition of book cover art during Book Week Scotland. The physical exhibition, called ‘Design by the Book: a Scottish Publishing Showcase’, will be shown in the Castle Vaults at Edinburgh Castle for the duration of Book Week Scotland and then move to the Chapel Royal at Stirling Castle from December 5th-11th. Send me original prayers rooted in the life of your community. Any style or type, but send a prayer that you think would be helpful in our daily discipline. Thank you. We are excited to invite you to our next Continentals Meeting, which will take place in Salzburg, Austria, 7th September-10th September, 2017. We will meet at the guesthouse of the Pallottiner Order of monks, right in the City of Salzburg. The theme of the gathering is ‘Care and share’. The Fair Trade shop Hadeel have a scheme whereby anyone in the UK, for £100, will receive a box of goods to at least that value – post free. Order a box for Christmas or a birthday, to put on your Fair Trade stall or to share with your Iona Community Family Group! Hadeel was founded by Iona Community members Carol and Colin Morton. Bulldozed. That’s what I am feeling. The country which had made significant strides (but not yet there by any means) in racial justice; the country which was seeking to make sure that folks have healthcare; the country which was working on climate change; the country which sought to welcome those who had been bombed, devastated, abused, tossed aside by other powers – that country has been levelled by a force I never thought possible. My wife and millions of other women have seen their dream and hope of a person just like them becoming President of the United States bulldozed. Millions and millions of young people, LBGT, POC … have seen their aspirations turned to rubble. They are my brothers and sisters in Christ. I was personally shocked but not surprised. I have lived in five states and served congregations in very affluent and very poor areas. It is my experience that the vast majority of the people see no connection between D.C. politics and their own lives. They don’t want a professional politician, or a professor, or a lawyer, they want a truck driver or a factory worker who understands them and shares their life experience. They got a Reality TV star who mirrored the worst, but very prominent, characteristics of this nation. ‘No one in our county’s Republican party supports him or agrees with him’, an elected Republican officeholder. ‘The Democratic Party failed me by promoting an unelectable candidate’, several Democratic supporters. I found my own church secretary crying in the office. She is a cancer survivor and fears she might lose her recently instituted healthcare. At a meeting of the Suicide Prevention Task Force I heard from a number of mental health professionals that on election night and the following morning the emergency room was very busy with people suffering anxiety attacks. This included a gay couple who feared their marriage would be dissolved. Our countywide telephone Crisis Line almost crashed due to the number of calls. Several colleges and universities went into ‘crisis mode’ and offered immediate, free counseling to any student. This is what I wrote the morning after the election. With heart broken for what I believe this means for our country, I tried to move to encourage myself and others to take a deep breath. Some of my family, some of my friends and colleagues, people who I love and deeply care for in my life, did not vote the way that I did. This vote will not divide me from the people I love and care for. We will still share good food together, talk with one another, disagree with one another, and continue to love one another. This vote will not divide me from my truest self. ‘Listening to the land’ – whether walking in the woods or on an ocean beach, or sitting on a bench at Kirkridge – offers lessons to me about how I want to be and live in this world. I have to say that I was shocked and saddened by the result the other night. The method of campaigning has left many minorities feeling very vulnerable at the moment – from those of different ethnicity to those of the LGBT+ community. The following appointments of officers only seem to ramp up a very conservative response to the positive changes within American culture through the Obama years. However, as the son of a carpenter who had a terrible time in the 1980s trying to keep working, I see a parallel between this vote and the Brexit choice. I feel the failure to reinvest in traditional working communities in the last 30-40 years has brought a lot of this about. My biggest fear is what will happen when the instantaneous response is a bill to give tax cuts to the very wealthy and to dismantle Obamacare. I feel those who voted for new jobs will be truly outraged when this administration continues the ignoring of these communities that has led to this vote. I have also read and heard amazing sermons within the PC (USA) that clearly advocate a desire to stand against any draconian actions – such as deportation of Muslim Americans or building walls. So there is dismay, fear and also small glimmers of solidarity and hope. Like many others I watched the election night results turn from anticipated elation to utter despair. As Trump continues to offer positions of power to people of questionable integrity, many of us are reeling. Likewise his failure to take responsibility for the hate he so willingly unleashed during the campaign is unspeakable. Day by day occurrences of intolerance towards non-white Americans have shattered our collective sense of safety. We are grieving but not despairing. We know economic inequality is rampant and needs to be addressed; at the same time people of faith and countless communities are mobilising daily. We will not be silent, we will not lose heart, and we will not allow ‘Trumpism’ in all its forms to be the only measure of how our country shapes our common humanity, here and abroad. Thank you for asking! At least the compression I’ve been feeling in my rib cage, around my heart and lungs, has loosened up a bit and I can now take a full breath of air. That hasn’t been the case since Trump’s election as our next President. By way of antidote, yesterday we hosted a wonderful family reunion around our Thanksgiving table(s) with 17 present from 4 generations and a variety of political persuasions, celebrating what knits us together rather than lamenting about what pulls us apart. If ever there was an Advent approaching to remind me that light shines on in the gloom, fear and bigotry, and the Light will never be overcome, this is the Advent I need to hear that gospel more clearly. Outside my kitchen window tonight, I know that the lights on the Mt Hope Bridge have appeared in their holiday display mode and will remain so for the next six weeks … but the fog hovering over the river blots them from view. My normally optimistic outlook is similarly obscured. To put it succinctly instead of metaphorically, I haven’t been this ashamed of my homeland since the Vietnam War. On the BBC America evening news tonight, offerings included highlights from a movie clip, made in Mexico, about a search for a piñata in the guise of Donald Trump. It features a young lad desperate to have one for his upcoming birthday party and his mom undertaking a vigilant hunt for it. From the film clip it wasn’t clear whether that particular piñata was not yet being mass-produced or whether they were flying off the shelves as quickly as they could be stocked. But either way, smashing that effigy of him in the head with a stick – while blindfolded – isn’t likely to yield little sweet things falling out where his mouth used to be. I know there have to be more effective, if not more appealing, responses to our January ‘peaceful transfer of power’ … but my picture of them is still very foggy indeed. I had hoped to be through more of the grieving process, weeks on, having waited this long to reply to e-Coracle’s request for reactions, and into some sense of resolve for the days ahead. But currently, this is all I have – about the big picture – and it has been only in the small ways, in my family, my parish, my prayers for more light, that the fog lifts at all. Blessings to us all, nevertheless, in and through whatever weathers of the soul are brewing. This year’s election was the culmination of a Republican Southern Strategy, first articulated by Richard Nixon … which came into full bloom under Ronald Reagan. Though Trump speaks in the raucous accents and idioms of an ill-bred New Yorker, his expressions (with several word substitutions) were those which assaulted the mind and heart of my childhood and youth from the mouths of Southern demagogues, governors, police chiefs – and occasional ‘Christian’ preachers. They claimed that if elected, they would save the white race and the ‘Southern way of life’ from the corrupting influence of negroes and Communists. Dr Martin Luther King was a Communist. The Civil Rights Movement was a Communist plot. These were the longstanding, politically effective lies which were in the air I breathed in the 1950s and ’60s. The most frightening dimension of Trump’s success is his bringing out of the shadows and into public prominence persons who have largely been ‘underground’ since the 1960s. Represented as legitimate by Fox News and right-wing radio talk show hosts, these are the so-called ‘alt-right’, explicit white nationalists, the Ku Klux Klan, and virulent anti-Semites. They have always been present in the United States, but Trump has now given them a legitimacy they have not known since the days of violent opposition to the Civil Rights Movement. Some of these people now have direct access to the White House. They represent a multitude of Americans who deeply resent having a capable, eloquent African American in the White House. Pray that we might give a faithful witness. For over 30 years the Open Door Community in Atlanta, Georgia has fulfilled a remarkable ministry of witness, hospitality and political commitment that has touched for good the lives of countless people worldwide. Located close to downtown Atlanta, it is a residential community in the Catholic Worker tradition that seeks, as its website says, ‘to dismantle racism, sexism and heterosexism, abolish the death penalty, and proclaim the Beloved Community through loving relationships with some of the most neglected and outcast of God’s children: the homeless and our sisters and brothers who are in prison’. Rooted in prayer, worship and a steadfast commitment to justice, with the assistance of many volunteers from local churches and elsewhere, the members of the community have faithfully, day by day, week by week, served meals, provided showers and changes of clothes, staffed a free medical clinic and foot clinic, conducted worship services, and provided a prison ministry, through facilitating monthly trips for families to visit loved ones at the Hardwick Prisons in central Georgia. The community is committed also to advocacy and campaigning against racism, poverty and the death penalty through non-violent protests, grassroots organising and the publication of its monthly newspaper Hospitality. Within the Iona Community we have been praying regularly for the Open Door for over 15 years; some of us have had our horizons extended and commitment deepened by visiting and working at the Open Door; and we have welcomed some of the ‘elder leaders’ (as they describe themselves) to Scotland: two of the founders/leaders, Murphy Davis and Ed Loring, led a week on Iona in 2002. Like the Iona Community, arguably even more effectively, the Open Door embodies an integrated and engaged approach to spirituality – holding together work and worship, prayer and politics, treating the people it serves with great sensitivity and compassion. But now the Open Door is to close – in mid-January next year. While aspects of the ministry will continue – the monthly publication of Hospitality, for example, and the campaigning and advocacy, the practical services from the building in central Atlanta will cease. There are three basic reasons for this: with the senior leaders getting older and the absence of longer-term replacements, there are not enough able-bodied committed community members to continue the regular services; with increasing gentrification the character of the neighbourhood where the house is located has changed significantly so that it has become an inhospitable place for the homeless poor and there has been a substantial drop in the demand for the Open Door’s services; and the building, despite recent refurbishment and repair, now needs too much money and work to maintain it. The point has now been reached where this courageous but very painful decision was inevitable. The long-term community members are being relocated to housing and support, and the six ‘elders in leadership’ are moving to live closer to their families in different parts of the US. We in the Iona Community shall continue to hold in our prayers all those who have been involved in the Open Door and the aspects of the work that will continue in other ways and places. The closure of the work in Atlanta at this point is far from failure: rather it is a miracle it has gone on for so long with such energy, vision and cutting-edge commitment; stopping something at the right time (kairos) in no way negates or diminishes almost 35 incredible years of witness, caring and striving for justice. Norman Shanks is a former Leader of the Iona Community, who spent a month at the Open Door as a volunteer in 2000 and has returned several times since. Ruth and he spent three months in Atlanta in 2007, and on the basis of her experience there Ruth, along with member Katy Owen, now run two foot clinics, at Glasgow’s Lodging House Mission and the Destitution Network’s night shelter for asylum-seekers. As they are on the margins of resistance. Give us this day everything we need. Long-time Iona Community member Brian Brown died on October 15, 2017. Our thoughts and prayers are with Brian’s family and friends. A full tribute to Brian will appear in Coracle. ‘On January 21, 2017 we will unite in Washington, D.C. for the Women’s March on Washington. We stand together in solidarity with our partners and children for the protection of our rights, our safety, our health and our families – recognising that our vibrant and diverse communities are the strength of our country. The rhetoric of the past election cycle has insulted, demonised and threatened many of us – women, immigrants of all statuses, those with diverse religious faiths, particularly Muslim, people who identify as LGBTQIA, Native and Indigenous people, Black and Brown people, people with disabilities, the economically impoverished and survivors of sexual assault. We are confronted with the question of how to move forward in the face of national and international concern and fear. In the spirit of democracy and honouring the champions of human rights, dignity and justice who have come before us, we join in diversity to show our presence in numbers too great to ignore. The Women’s March on Washington will send a bold message to our new administration on their first day in office, and to the world, that women’s rights are human rights. We stand together, recognising that defending the most marginalised among us is defending all of us. 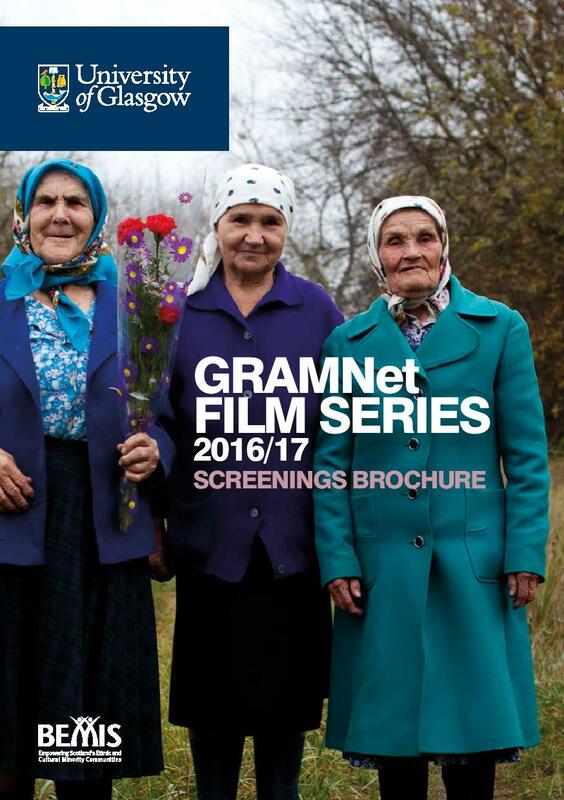 The GRAMNet/BEMIS Film Series brochure is out! This year we bring you documentary and feature films from Scotland and around the world making up a programme that illustrates the diversity and commonalities of those who endure exile and persecution. The films we have selected, and for which we have received generous support, often from the makers and distributors themselves, depict stories of people who must manage extreme risk in order to survive and flourish. Using the compelling medium of film, the series explores difficult questions of what it means to be human and how powerful structures place human beings in complex scenarios which force people into exceptional circumstances. These are stories of loss, but are also stories and acts of resistance, solidarity and empowerment, revealing survival strategies which bind people together forming communities of hope against adversity. The films in our series are groundbreaking in terms of content, form and production methods: protagonists themselves become filmmakers by documenting their own epic journeys of exile and refuge; personal and historical home-video footage gives an intimate portrayal of life in a refugee camp; cameras hidden in bags and clothes get inside detention camps to expose the horrors of detention; and film crews spend months returning to toxic exclusion zones to capture the defiance of the human spirit. Together these films create a picture of lives in motion, refusing to be denied their right to exist. Iona Community member Alison Swinfen is Co-Convenor of GRAMNet and UNESCO Chairholder in Refugee Integration through Languages and the Arts. The nature of Christian mission in Scotland is changing rapidly. It’s a time for discussion, exploration and experimentation, and a dialogue between theological reflection and the experience of practitioners has never been more important. This conference will provide a forum for debate across theological boundaries. It offers the chance to hear diverse voices and will widen perspectives, affirming the work of those at the frontiers of mission in Scotland today. Our plenary speakers are Dr Wesley White, Lecturer at the Scottish School of Christian Mission and leader at the Upper Room Church in Glasgow, and Rev Ian Galloway, parish minister in the Gorbals, Glasgow, and former Convener of the Church and Society Council of the Church of Scotland. Seminar speakers include Alison Urie (Vox Liminis, Glasgow), Rev Malcolm Round (Rector, St Mungo’s Episcopal Church, Balerno), Pam Mellstrom (Youth and Community Work Programme Manager, Scottish School of Christian Mission and former manager of Linlithgow Young People’s Project), Catriona Fletcher (Ignatian Spirituality Centre, Glasgow), Dave Close (Hot Chocolate, Dundee), and the Very Rev Albert Bogle (former Moderator of the General Assembly of the Church of Scotland), among others. Worship and reflection through art will be provided throughout the day by Lou Davis, Edinburgh Dreams (a pioneer venture of the Methodist Church). Lunch and refreshments are included in the conference price. A new book, which you might have missed, featuring essays by Andrew Francis, the Rt Rev Dr David Walker, Bishop of Manchester, Sean Gardiner, Chris Horton, Helen Roe, Helen Woolley, Paul Lusk and Iona Community member Raymond Young. and full of bad memories. to listen to people who tell us their stories. and to love and listen. or food for their table. It’s good to share our resources. Christmas doesn’t work for everyone, does it, God? as well as in the manger. I have to confess I haven’t really looked at an e-coracle before because I use my computer for work and don’t have time to read then and I rarely look at it in an evening. But I’m writing my 2016 letter and looked at it this evening. It was all of interest but the American response to the election results and Dora’s prayer especially engaged me. Thank you! Thank you, Neil, for a magnificent e-Coracle – reading the reflections of our American colleagues was inspiring even if harrowing, and so much else was absolutely excellent. We are well served by this medium, and by your editing of it.